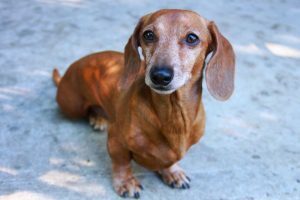 Lucy, a 12 year old, female spayed miniature dachshund was presented to Specialists in Companion Animal Neurology for evaluation of seizures and behavior change. She had a single seizure 6 months prior to presentation and then experienced cluster seizures just prior to referral. In addition, Lucy had developed a slightly dull mentation. CBC, serum chemistry (including T4) were unremarkable. After the cluster seizures, her primary care veterinarian began phenobarbital (starting dose of 3 mg/kg PO BID) and then referred her to SCAN for a neurology consultation. The owner expressed concern with the level of sedation that the phenobarbital was causing. Upon neurological examination, Lucy had a slightly dull mentation. She had a slight right torticollis and displayed a tendency to track to the right while ambulating. Lucy had a normal gait but exhibited conscious proprioception deficits on her left thoracic and pelvic limbs; she also exhibited a menace deficit OS. The neuroanatomic localization was to the cerebrum or forebrain. The primary differential diagnoses included: intracranial neoplasia, vascular encephalopathy, infectious/inflammatory encephalopathy or, less likely, Idiopathic Epilepsy. Thoracic radiographs were unremarkable. Blood pressure using a Doppler was recorded at 200, 208, 220 mmHg systolic. Though Lucy was severely hypertensive, the decision was made to proceed with MRI of the brain to determine if there were additional primary causes for seizures. 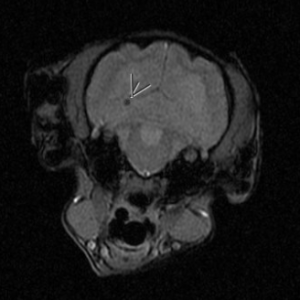 In the T2* images, multiple variably sized signal void defects were seen throughout the left cerebral hemisphere. The largest was identified in the left occipital lobe and its size was more consistent with a macroscopic hemorrhagic infarct. There was also a bilateral non-enhancing encephalopathy which could be secondary to the hypertension or age-related changes. These diagnostics revealed that Lucy’s hypertension had caused multiple small hemorrhages within the brain which were, in turn, responsible for her seizures. It was also recommended for Lucy to have an internal medicine consultation and a cardiology consultation to evaluate for the primary cause of the hypertension. Note the hypointense (black) circles (arrows) throughout the cerebral cortex. 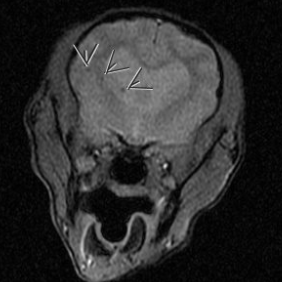 This set of MRI images is specific for identifying blood within the brain parenchyma as seen in this series. Lucy was prescribed amlodipine (0.3 mg/kg/day PO) for the treatment of her hypertension and zonisamide (5 mg/kg PO BID) for the management of her seizures. The owner was instructed to discontinue the phenobarbital, primarily due to its side effects in this patient. At Lucy’s two week re-check, she was seizure-free (and continues to be), her blood pressure had normalized and her behavior was back to normal. A serum chemistry was performed which showed the BUN was slightly elevated 36 (normal: 7-27). Recommendations were to have the blood pressure, BUN, creatinine, urinalysis and SDMA evaluated in 6-8 weeks with her primary care veterinarian. In one recent study (Kerwin SC, et al 2017) looking at the incidence of cerebral microbleeds in 582 dogs undergoing brain MRI, it was found that dogs with cerebral microbleeds were significantly older and smaller than unaffected dogs. Compared to matched controls, they presented more frequently for vestibular signs. 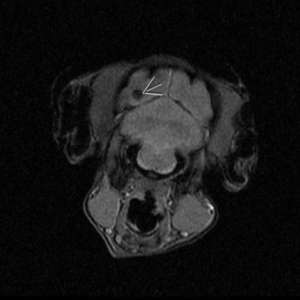 Cortical atrophy occurred concurrently with microbleeds in 26% (14/54) of dogs. Proteinuria was more common in dogs with microbleeds and affected dogs had a shorter median survival time than did matched controls. Cerebrovascular disease is becoming a more frequently recognized etiology because of increasing brain MRI studies performed on dogs and cats. Following recognition of cerebrovascular disease, an evaluation as to the underlying cause is performed. Cerebrovascular disease in the dog has been associated with sepsis, coagulopathies, atherosclerosis (due to hypothyroidism), hyperviscosity syndrome (associated with plasma cell myeloma or macroglobulinemia), uremia, cardiomyopathy, primary or metastatic brain tumors, polycythemia, dirofilariasis, rickettsial (i.e. ehrlichiosis, Rocky Mountain spotted fever) infections, hypertension, hyperadrenocorticism, and vascular malformations. In this patient, Lucy, hypertension was present and treated accordingly. The next step was to evaluate for a cause of hypertension. Primary (essential) hypertension is generally considered idiopathic; whereas secondary hypertension (caused by a disease) is the most common form in dogs. Diseases associated with systemic hypertension include chronic renal insufficiency, diabetes mellitus, hyperadrenocorticism, hyperaldosteronism, pheochromocytomas, hyperthyroidism, acute renal disease, and protein-losing nephropathies. Medications that have been known to cause elevated blood pressure include: glucocorticoids, mineralocorticoids, erythropoietin, phenylpropanolamine, and nonsteroidal anti-inflammatory drugs. Despite an abdominal ultrasound, normal labs and an echocardiogram, no cause for Lucy’s hypertension was identified. At the time of this writing, Lucy is doing very well and has not had any additional seizures. Weaning off the zonisamide may be considered after Lucy is still seizure-free after 4 months.